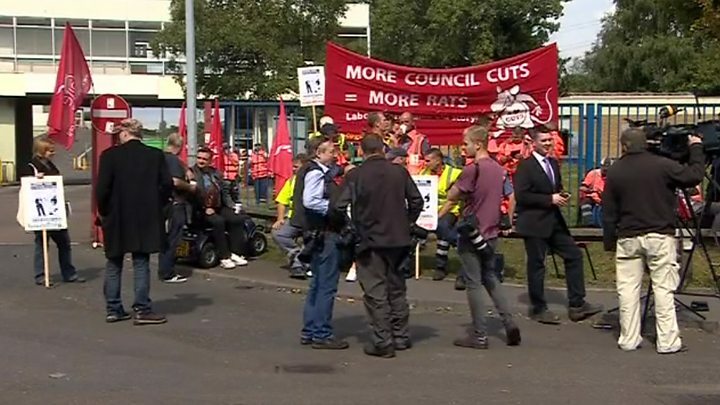 Bin workers have returned to the picket lines as strike action in Birmingham resumed after a deal fell apart. A seven-week strike that saw mountains of waste pile up on streets was suspended on 16 August amid talks between Unite and the city council. However, on Thursday the council went back on an agreement that saw the strike suspended and said a meeting due on Friday would not now happen. The Unite union has warned that action will continue until the end of 2017. Unite assistant general secretary Howard Beckett said the council's actions had "made it a certainty that the people of Birmingham will suffer this chaos and disruption and rubbish on their streets for the rest of 2017". However, council leader John Clancy said a deal had never been fully agreed with the union. 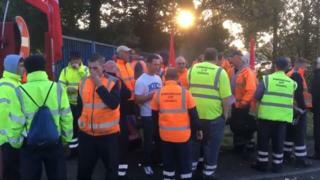 The dispute centres on restructuring plans that Unite says are threatening the jobs of more than 120 refuse collectors. Birmingham City Council says the plans will modernise the service and save £5m a year. However, a council report said the deal struck by Unite and the council was unaffordable. On Thursday the council said it was issuing redundancy notices to certain grade three workers "in order to protect its legal and financial position". This prompted strike action to resume on Friday morning, with three-hour stoppages spaced across shifts, taking place daily at 07.00, 10.30 and 13.00 BST. Mr Beckett described the council's decision as "outrageous industrial sabotage" and called for Mr Clancy to "give reasons" for it. He said: "I reached a deal with John Clancy and Acas on 15 August. That deal was publicised by Acas on the 16 August after my members authorised it and suspended industrial action. "I was told by John Clancy, and have a text communication from him, that the cabinet approved the deal on the 21 August, yet I have a statement yesterday, and I haven't heard from John Clancy, that there's this sudden reversal." "Deal or no deal - there was no deal. My cabinet and I came together with a negotiating position to try to see what we could do to go that extra mile to get a negotiated solution. "If there had been a deal to end the dispute, the strike would have ended, it wasn't, it was suspended. "So, there was no deal, there was an agreement in principle to talk at Acas and my cabinet and I agreed some heads of terms that would enable us to get into Acas to talk, there has been no deal concluded with Unite. "Unite have said there was a deal for their own purposes. There was never a deal." The council has said it wished to continue ongoing discussions "with trades unions through Acas in parallel with seeking alternative jobs for the Grade 3s affected by redundancy".